All my cushions are getting old and yuck, so I decided to make some of my own. I need 7 in total and have decided to 3 designs: 4 circular ones in contrasting tones (two sets of two in different colour orders), 2 Mabel cushions by SarahLondon and Attic24's Blooming cushion. 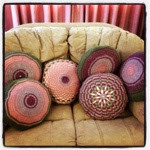 I will use the same wool for the circular and Mabel cushions. I have yet to decide the colours for the Attic24 one. I bought some lovely Debbie Bliss cashmerino aran wool from Deramores. It is gorgeous and soft and lovely to work with. I chose pale pink, heather, aubergine and basil. 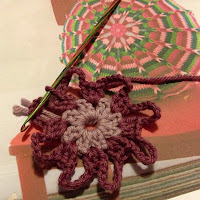 Here is the start of my Mabel cushion. I am using a lovely knit pro symfonie crochet hook; it looks fab with its different colours and is wooden. It has a very silky feel to it and the hook is a little deeper than the metal ones I have used. 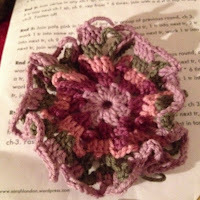 It still looks like a frilly doily but with a bit of tweaking you get the idea of the end result. It looks very effective. The cushion has metamorphosed from a blobby jellyfish, to a frilly doily into a lovely cushion. I'm quite pleased with the result. Betty made a convenient prop to show it off! 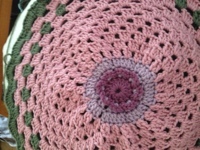 For my last cushion I have decided to adapt a pattern of Miss Abigail's Hope Chest: specifically her "Vintage Rose" granny round crocheted dishcloth. I shall use the same colours as the other cushions so the colour scheme matches but will have a different look. I wasn't sure how to attach the front and back as one was scalloped and the other round. I tried slip stitching the back following the contours of the front but it made the cushion look wonky as it flattened out the scallops. So I decided to hand stitch the back to the front in line with the base of the scallop and so retained the flower effect at the edge. 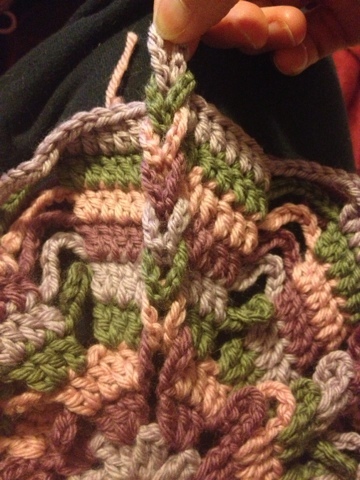 (This was taken during the stitching together and so you can still see a bit of the white cushion poking through). This completes my set of cushions.......for now, although I do still plan to do Attic 24's blooming cushion. 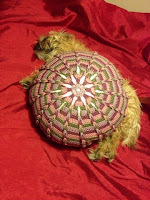 But as you can see I decided against doing 2 Mabel cushions.........well it is a woman's prerogative to change her mind!